In the last two decades, movie star Robert Downey Jr. has achieved good health and he credits it all to Traditional Chinese Medicine. Downey spoke about his gratitude for the ancient medicine while being honored for his advocacy with the Robert Graham Visionary Award in March. The award was presented by Yo San University founders Daoshing Ni and Mao Shing Ni in a small ceremony at the Malibu home of philanthropist Lilly Tartikoff. The emcee for the event was Brenda Strong, an actress who was on Desperate Housewives, and is currently in the new Dallas series. Downey, who has starred in countless blockbuster hits including most recently Sherlock Holmes, Iron Man and The Avengers, has become and advocate for TCM which he says has had a profound impact in all areas of his life for many years. During his award presentation, Downey entertained a crowd of 200 people with wit and humor while receiving the award. 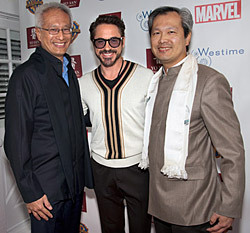 Yo San University Co-Founders Dr. Daoshing Ni and Dr. Mao Shing Ni with Robert Downey Jr. “[When they called to tell me about the award] I thought about it and I said, well wow, ‘Do I really qualify for this?’ and it only took a second for me to say ‘Robert, you deserve this as much as anyone,'” joked Downey. Jokes aside, Downey went on to speak highly of Traditional Chinese Medicine and the difference it made in his life. Truth be told, every discipline that I have employed that has its roots in the Chinese tradition has worked, and that’s what I’m really drawn to, it’s the way is the way is the way, and when things work, they are really worth putting your time and energy behind,” Downey said. The Robert Graham Award is named after the late Robert Graham, a dedicated trustee of the university and advocate of traditional Chinese medicine. Dr. Mao Shing Ni who has treated Downey said there was no question about giving the award to Downey, who has been a great example of what Traditional Chinese Medicine can do. “What he has done as a spokesperson for Chinese medicine and from the perspective of where he was health wise to where he is today, it has been very positive for him and that is why he is here to support our event,” said Dr. Mao Shing Ni. In the spirit of honoring Downey, the event featured an auction of several unique items, some of which were used in many of Downey’s movies. There was a pipe and an auction paddle, which he used in Sherlock Holmes, and a racing suit with a helmet from Iron Man 2, among other items. All proceeds went to benefit various programs at Yo San University, a non-profit organization, focused on the spiritual and professional growth of TCM students. The programs at the school provide the community with an integrative medical care model and services.